The Mozilla Foundation's controversial plan to bring ads into the Firefox browser has commenced, with new nightlies of the Firefox browser now including the Directory Tiles feature that users hated in its last implementation. Directory Tiles have now morphed into “Sponsored Tiles”, the distinction being that the former are unpaid and are placed at Mozilla's discretion. The latter are offered in exchange for coin. As the Foundation explains in an FAQ, it is possible to turn off the Sponsored Tiles, but only if you turn off all Tiles. Doing so means opening a new tab in the browser will not result in any Tiles appearing, which means you'll be deprived of the browser's ability to turn your most-visited sites into nice, big, easy-to-access shortcuts. Alternatively, you can view in "Classic" mode, which only shows unenhanced history tiles. 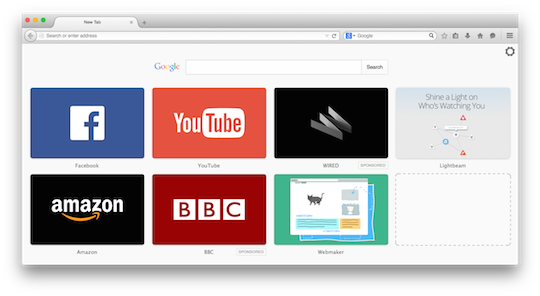 For now, Mozilla is giving away Tiles, picking sites it thinks users will appreciate. Once sponsors sponsor Sponsored Tiles, they'll be marked as having been paid for. Oi! Mozilla? How about a Tile for El Reg? “Pinning helps protect users from man-in-the-middle-attacks and rogue certificate authorities,” Chew argues. Which is right. But the feature can also create problems. Site operators need to be aware of it, which can make for extra work. There's also the potential for Firefox to get things wrong. Chew warns that new WiFi connections, for example, might create transient pinning problems as certification chains break.